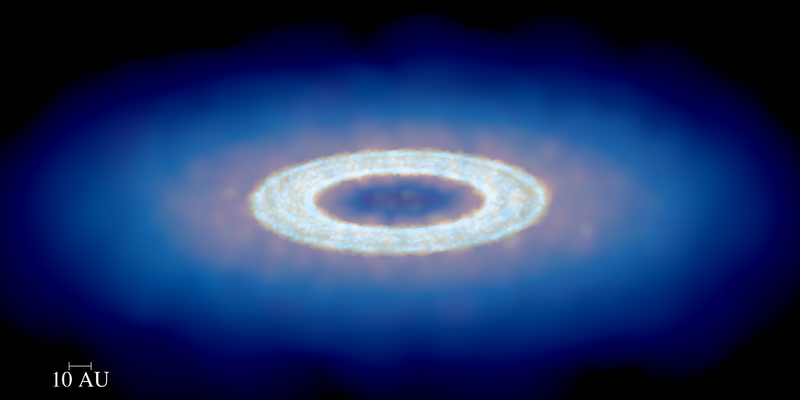 Planets are thought to form in the disks of dust and gas found around young stars. But astronomers have struggled to assemble a complete theory of their origin that explains how the initial dust develops into planetary systems. A French-UK-Australian team now think they have the answer, with their simulations showing the formation of 'dust traps' where pebble-sized fragments collect and stick together, to grow into the building blocks of planets. They publish their results in the journal Monthly Notices of the Royal Astronomical Society. Our Solar system, and other planetary systems, began life with disks of gas and dust grains around a young star. The processes that convert these tiny grains, each a few millionths of a meter (a micron) across, into aggregates a few centimeters in size, and the mechanism for making kilometer-sized 'planetesimals' into planetary cores, are both well understood. The intermediate stage, taking pebbles and joining them together into objects the size of asteroids, is less clear, but with more than 3,500 planets already found around other stars, the whole process must be ubiquitous. Dr Jean-Francois Gonzalez, of the Centre de Recherche Astrophysique de Lyon, in France, led the new work. He comments: "Until now we have struggled to explain how pebbles can come together to form planets, and yet we've now discovered huge numbers of planets in orbit around other stars. That set us thinking about how to solve this mystery." There are two main barriers that need to be overcome for pebbles to become planetesimals. Firstly the drag of gas on dust grains in a disk makes them drift rapidly towards the central star, where they are destroyed, leaving no material to form planets. The second challenge is that growing grains can be broken up in high-speed collisions, breaking them into a large number of smaller pieces and reversing the aggregation process. The only locations in planet forming disks where these problems can be overcome are so-called 'dust traps'. In these high-pressure regions, the drift motion slows, allowing dust grains to accumulate. With their reduced velocity, the grains can also avoid fragmentation when they collide. Until now, astronomers thought that dust traps could only exist in very specific environments, but the computer simulations run by the team indicate that they are very common. Their model pays particular attention to the way the dust in a disk drags on the gas component. In most astronomical simulations, gas causes the dust to move, but sometimes, in the dustiest settings, the dust acts more strongly on the gas. This effect, known as aerodynamic drag back-reaction, is usually negligible, so up to now has been ignored in studies of growing and fragmenting grains. But its effects become important in dust rich environments, like those found where planets are forming. The effect of the back-reaction is to slow the inward drift of the grains, which gives them time to grow in size. Once large enough, the grains are their own masters, and the gas can no longer govern their motion. The gas, under the influence of this back-reaction, will be pushed outwards and form a high-pressure region: the dust trap. These spontaneous traps then concentrate the grains coming from the outer disk regions, creating a very dense ring of solids, and giving a helping hand to the formation of planets. Gonzalez concludes: "We were thrilled to discover that, with the right ingredients in place, dust traps can form spontaneously, in a wide range of environments. This is a simple and robust solution to a long standing problem in planet formation." Observatories like ALMA in Chile already see bright and dark rings in forming planetary systems that are thought to be dust traps. Gonzalez and his team, and other research groups around the world, now plan to extend the trap model all the way to the formation of planetesimals.